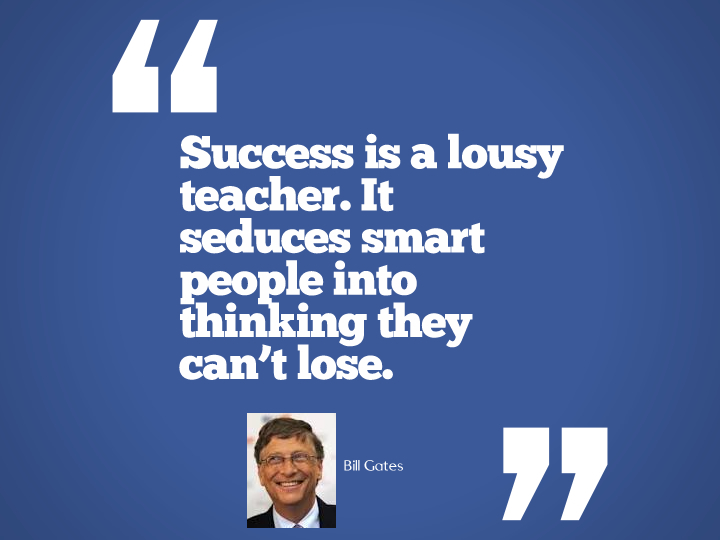 When describing the life of billionaire Bill Gates the words visionary, genius and business expert keep reiterating. He became a billionaire at the age of just 31. The American business tycoon, philanthropistand computer programmer co-founded Microsoft with Paul Allen in 1975. Movies, books and TV shows have brought forth this legend’s professional and personal life to the forefront. In 2017, Gates gave $4.6bn to charity in biggest donation since 2000. His Foundation is tackling some serious issues facing the world such as extreme poverty, poor health and education. 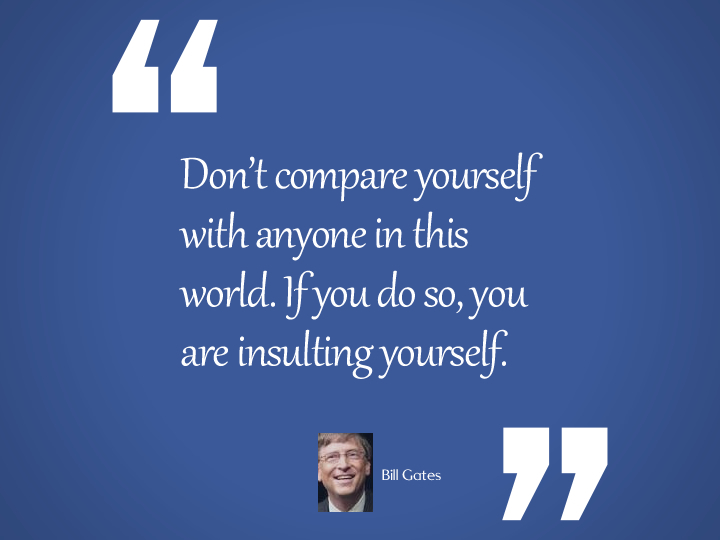 Read some of Bill Gates’ quotes and get to know the man who revolutionised the world of home computer. In three years, every product my company makes will be obsolete. The only question is whether we will make them obsolete or somebody else will. The impact on our society of the computing revolution is simply breathtaking — it has changed the way we work, play, learn and communicate. Think about how you find people with common interests, how you pick a doctor, how you decide what book to read. Right now it’s hard to reach out to a broad range of people. You are tied into the physical community near you. But in the new environment, because of how information is stored and accessed, that community will expand. This tool will be empowering, the infrastructure will be built quickly and the impact will be broad. The two areas that are changing in this amazing way are information technology and medical technology. Those are the things that the world will be very different 20 years from now than it is today. Right now cryptocurrencies are used for buying fentanyl and other drugs so it is a rare technology that has caused deaths in a fairly direct way. Automation is a great thing – eventually we won’t have to work as much but we are still at least a generation away from a big change there. Say you want to watch a movie. To choose, you’ll want to know what movies others liked and based on what you thought of other movies you’ve seen, if this is a movie you’d like. You’ll be able to browse that information. Then you select and get video on demand. Afterward, you can even share what you thought of the movie. You don’t really start getting old until you stop learning. Every book teaches me something new or helps me see things differently. Reading fuels a sense of curiosity about the world, which I think helped drive me forward in my career and in the work that I do now with my foundation. Steve and I were very different. But we were both good at picking people. We were both hyperenergetic and worked super­hard. We were close partners in doing the original Mac software, and that was an amazing thing, because we had more people working on it than Apple did. But we were very naive. Steve promised us this was going to be this $499 machine, and next thing we knew, it was $1,999. Anyway, the Mac project was an incredible experience. All operating systems, including IBM’s, Sun’s, Apple’s and many others are including Internet browsing capabilities, … The beauty of the Internet is its openness. It cannot be controlled or dominated or cut off because it is simply a constantly changing series of linkages. At Microsoft there are lots of brilliant ideas, but the image is that they all come from the top — I’m afraid that’s not quite right. It’s pretty amazing to go from a world where computers were unheard of and very complex to where they’re a tool of everyday life. That was the dream that I wanted to make come true, and in a large part it’s unfolded as I’d expected. You can argue about advertising business models or which networking protocol would catch on or which screen sizes would be used for which things. There are less robots now than I would have guessed. Part of India’s great success in the IT sector comes from the fantastic investment that the government has made over decades in institutions like the Indian Institutes of Technology. India only has six or seven million seats at its universities, and it will need 20 to 25 million, so I think this is a great opportunity to rethink the idea of a university. The software is where the magic is. If you’re going to have all this power be simple enough, appealing enough and cool enough, it’s going to be because the software is right. You know, even when we wrote down at Microsoft in 1975, ‘a computer on every desk and in every home,’ we didn’t realize, oh, we’ll have to be a big company. Every time, I thought, ‘Oh, God, can we double in size? You see, antiquated ideas of kindness and generosity are simply bugs that must be programmed out of our world. And these cold, unfeeling machines show us the way. The world needs to prepare for pandemics in the same serious way it prepares for war. There’s one area though where the world isn’t making much progress and that’s pandemic preparedness. The next epidemic could originate on the computer screen of a terrorist intent on using genetic engineering to create a synthetic version of the smallpox virus… or a super contagious and deadly strain of the flu. if anything kills over 10 million people in the next few decades, it’s most likely to be a highly infectious virus. Even a nuclear weapon going off in New York City wouldn’t be 10 million. I’d be working on an essay and start wondering, ‘Am I going to get an A or a C on this thing? What skills do I need to improve? When students get out in the world, they have to organize their own time, have goals, and realize what they’re behind on. It’s fantastic to see them getting a head start on those skills in school. 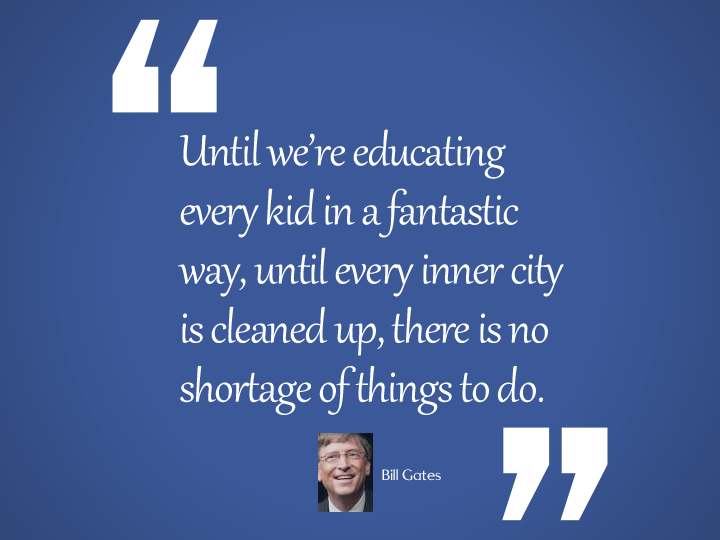 And research has shown that having a great teacher can be the most important factor that determines whether students get a great education. The Internet will help achieve “friction free capitalism” by putting buyer and seller in direct contact and providing more information to both about each other.